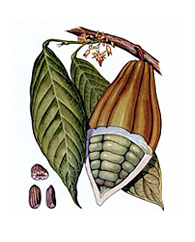 Cacao-tree (Theobroma Cacao) is a tree 4-12 metre high with an average thickness of 20 centimetres. Its rather small, non-fragrant blossoms appear all the year round in clusters directly on strong branches and trunk. Although cacao-trees bring a lot of blossoms, they give relatively little fruit, because most of the flowers fall away and only a small per cent provide ripe fruit. The blossoms are white or rosy without smell or much nectar, thus being uninteresting for most insects. Cacao-trees bring roughly 4-5 months after blossoming maturing fruit due to self-pollination or pollination carried out by a small spider (Forcipomyea). The fruit sizes differ according to the cacao-tree type; they are up to 25 cm long and 10 cm wide, their form reminding cucumbers. Inside you can find 30 to 70 dark brown to black, oval seeds, about three cm long, called cocoa beans. After their extraction cocoa beans are cleaned, fermented, dried and then brought to chocolate plants. Here they are roasted, peeled and ground to a fat cocoa mass, which, mixed with sugar and further ingredients, is then processed to chocolate. A part of the cocoa mass is pressed while warm, which enables to detach cacao butter and cocoa powder, known like cocoa. Besides mineral salts and a series of other ingredients, the cacao beans contain the alkaloid theobromine, which was used by the Native Americans for its tonic effects for body and mind even centuries ago. The Aztecs called the cacao-tree “cacauati” and this name was taken over by the Europeans with small modifications. The word chocolate is of the same origin, because the products and drinks made of cocoa beans were called “chocolati”. The first European to see a cacao-tree was Christopher Columbus, but only the Spanish conqueror of the Aztec empire Fernando Cortez brought cacao-tree fruit and chocolate cakes to Europe in 1528, and gave them to the Spanish king. At first the novelty remained without sensation in the royal court. Chocolate became popular only after its preparation with sugar. At first the new delicacy was very expensive and only the richest could allow it. It found its way to the whole world only after the Spanish secret was discovered by the Italians, French and Dutch.